First prepare the twigs. They need to be thoroughly dry - so after gathering them, wrap them in a tea-towel and place them by a radiator to dry out. 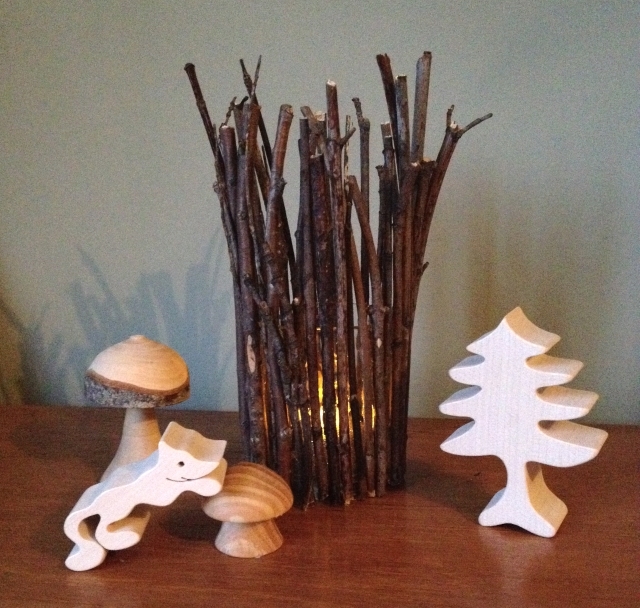 You can leave the twigs at whatever length they are, to give your candle holder a rustic, natural look. Or, if you prefer uniformity find one you are happy with the height of and use it as a template for the others to follow. Break the rest of the twigs to be roughly the same height as your chosen twig (or use a scissors or secateurs for a neater result). Keep the cut-offs to one side as they’ll come in useful later! NB: Parent’s need to help with this bit as glue guns can be hot and all-purpose glue can be toxic! 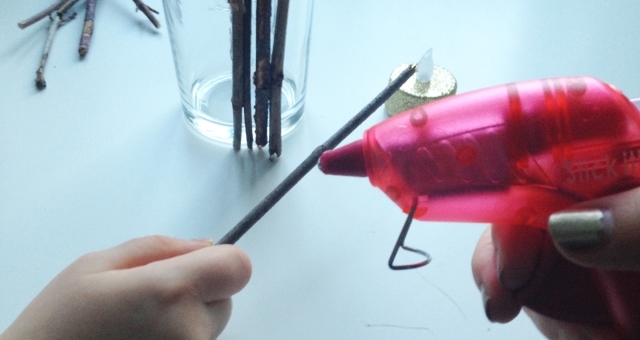 Help your child apply a line of glue to a twig and press it into place on the glass. 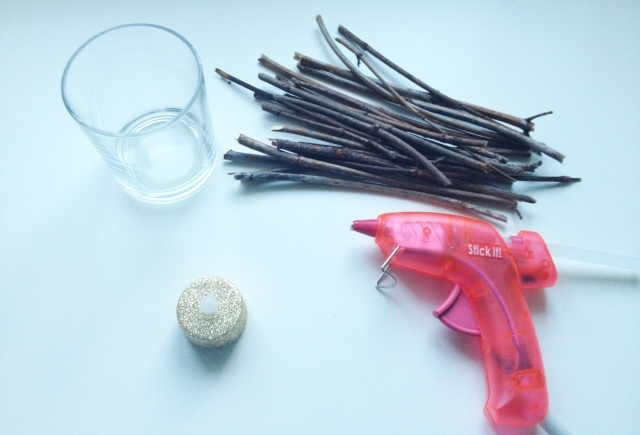 Hot glue sets almost instantly, but if you’re using another type of glue, you may need to hold each twig in place for a moment until it sets. Carry on adding twigs until the whole tumbler is covered. Don’t worry if there are gaps, as the leftover cut-offs can be used to fill these in at the end. When the tumbler is completely surrounded by twigs, pop in the tea light and enjoy! Embellish your candle holder by tying some twine or ribbon around the middle! 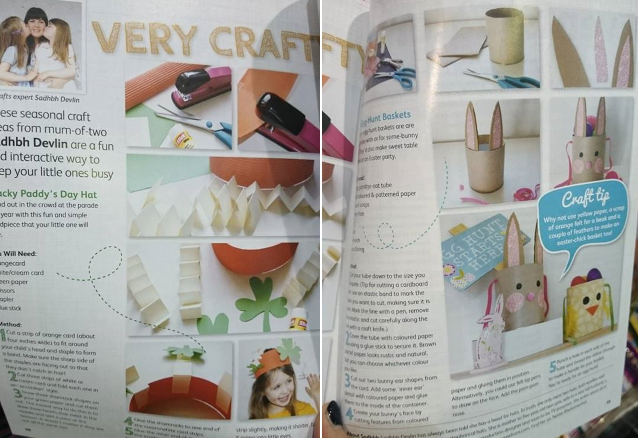 The latest edition of Easy Parenting magazine is in shops now and my contribution features a St. Patrick's Day craft and a cute Easter basket craft made from a recycled container. Big thanks to Naomi from Science Wows who snapped these pics in her local shop for me - I can't wait to get my hands on a copy for myself now! A great blog with wonderful ideas. Thanks for sharing.